A: from fellow Irish man Fitzy (Robert Fitzhugh) whilst trying to play soccer in the snow on a cold December morning! 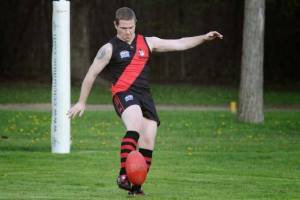 Q: how does it feel being an Irish man in Canada playing an Australian Sport? Q: What are your favourite things about being a Dingo? Q: We hear you have a big Martial Arts Tournament coming up in Montreal in a weeks’ time. What is it like to juggle both sports?